Winnie the Pooh baby shower theme is a perfect choice for unforgettable baby shower party. It isn`t difficult to create a magical atmosphere of hundred acre woods, where little bear lives. Use your imagination, just like Christopher Robin from Milne’s classic children’s story. 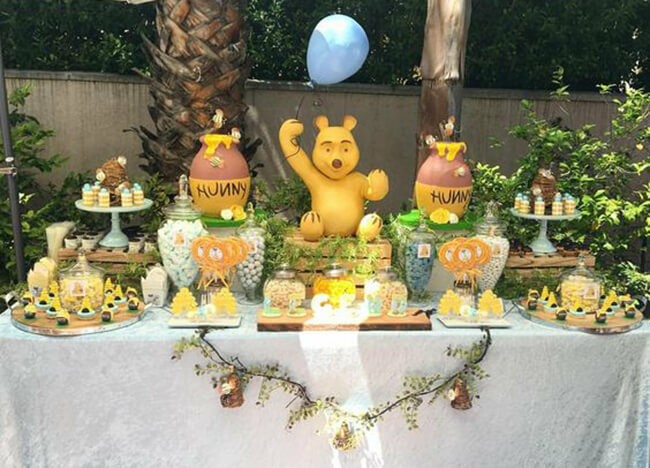 The first thing your baby shower guests see is a great number of light pastel yellow and green balloons at the entrance and a sign saying: “Hundred Acre Woods” or “Welcome to our Pooh baby shower for (baby’s name)”. Cut out paw prints of story`s characters and fix them on the floor, to show your guests the way to baby shower area. To achieve a better effect you can play Winnie the Pooh soundtrack as background. Decorate your living room with potted plants and trees, plush forest animals and pine cones to create the woodland entourage. Popular Winnie the Pooh decorating kits can include cut outs of Pooh, Piglet, Tigger, Rabbit, Eeyore and other characters, stickers and garlands, which helps you to decorate your home. A nice idea is serving baby shower food in honey pots. Cute toy Pooh bear can become a centerpiece of this lovely scenery.